Heat butter and olive oil in skillet over medium heat. Add onion and garlic. Cook for one minute or just until the onion and garlic is lightly golden and fragrant. Add the white wine and lemon juice. Cook for 1 to 2 minutes or until sauce has slightly thickened. Remove from heat. Stir in lemon zest and parsley. For each serving: Place 1 cup of noodles in each of 4 serving size pasta bowls. 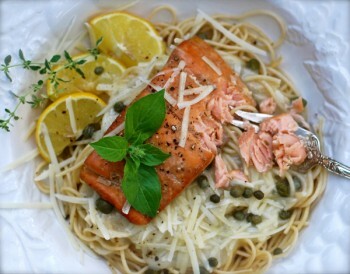 Top with some of the scampi sauce, a generous amount of fresh Parmesan cheese, a piece of grilled salmon, 1 Tablespoon of the capers, fresh basil and thyme sprigs, salt and pepper, and a few lemon wedges for squeezing over the fish.